We spent the Summer in South Florida, near Miami, house sitting and writing our first book Authentic Food Quest Argentina. To be more specific, we were in Wellington, near West Palm Beach, surrounded by the Cuban-American community. With Cuban-Americans making up more than half of Miami’s population, their influence is deeply rooted. And when it comes to the food, it is no surprise that there are many Cuban restaurants in Miami and its surrounding offering traditional Cuban food. In this article, we put a spotlight on four authentic Cuban restaurants and traditional dishes. Little Havana in Miami, Florida, got its name in the 1960s to reflect growing Cuban population. It is known to be the cultural and political capital of Cuban-Americans in the world. 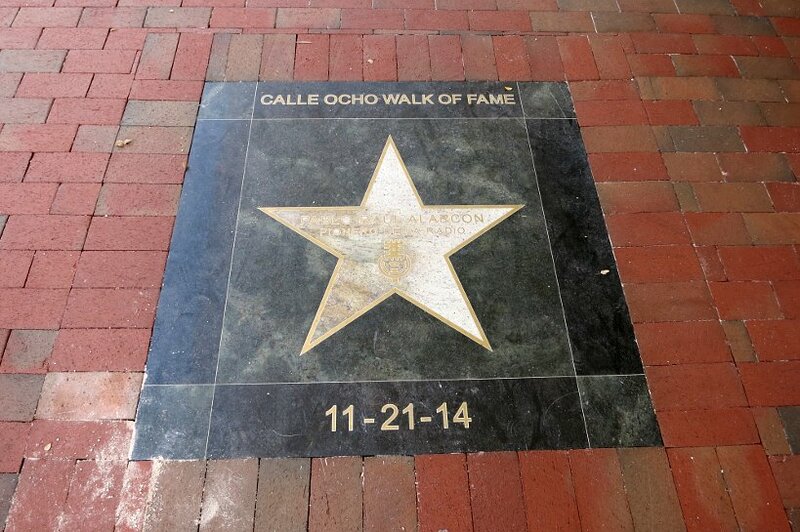 Little Havana’s landmark is Calle Ocho (S.W. 8th Street) and it is the walk of fame including the famous Domino park. If you walk by there, you will see domino players meeting in the park given that dominos is a popular game in the Cuban culture. When it comes to Cuban food in Miami, you will not have much difficulty finding something to your liking. You will see names like Versailles, one of Miami’s Cuban favorites, Puerto Sagua, a classic no-frills Cuban institution, or El Exquisito making the top of the ”best Cuban restaurant “ list. 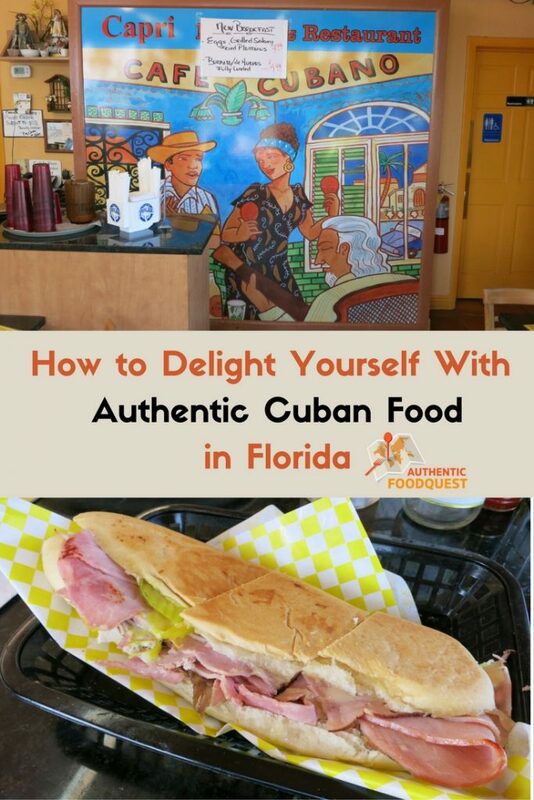 For a one day stop in Miami, we chose to go to one of the “best” Cuban restaurants in Miami: El Exquisito. Why did we choose to go to El Exquisito? Well, first it was highlighted as a true and authentic Cuban food restaurant. What made the scale tip in favor of El Exquisito is the location. 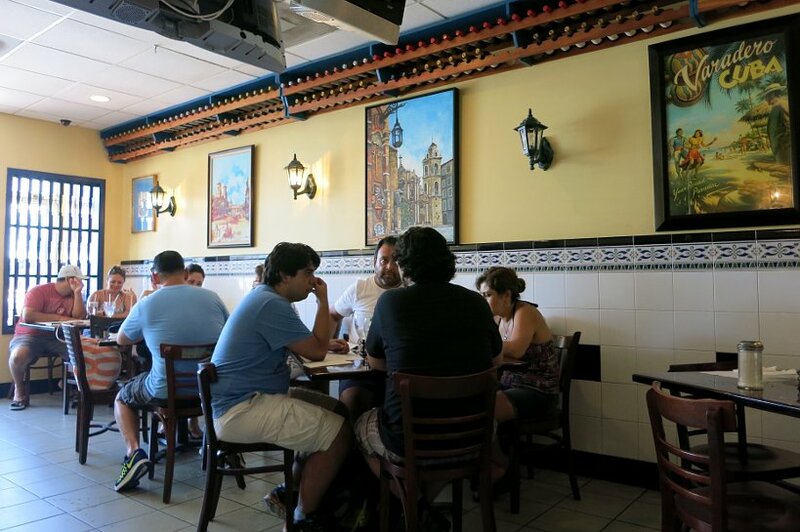 El Exquisito is in the heart of Calle Ocho. We didn’t have much time to spend in Miami, so a place conveniently located was of our main criteria after the food, of course. Indeed, El Exquisito is not only close to the famous Domino Park but also next to Los Pinarenos Fruteria. We’ll come back to Los Pinarenos Fruteria but first, let’s dive into our experience at El Exquisito. When you walk into this small restaurant, you immediately feel the local vibe. Everyone speaks Spanish and the waiter’s joke and laugh with the regulars. We took our seats at the back of the dining room and got the menus handed to us. The main meal we ordered was the Cuban classic: Ropa Vieja. Ropa Vieja is a Cuban beef stew made of shredded beef with tasty vegetables like onions, peppers, and tomatoes. 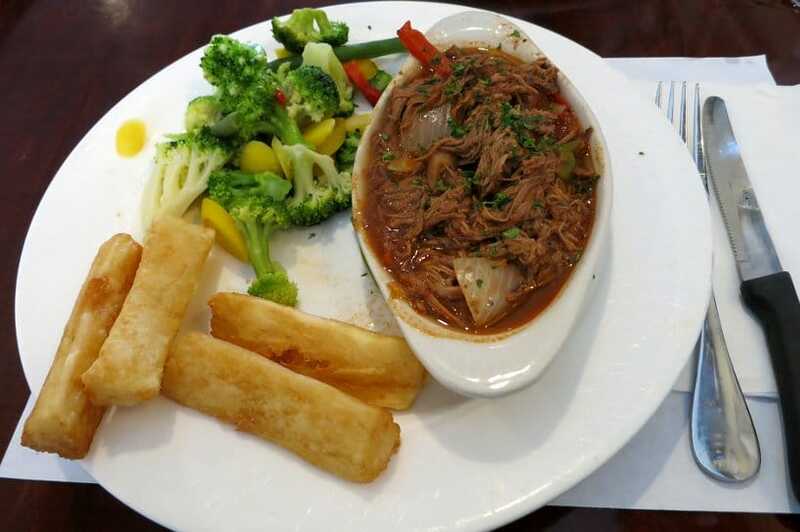 Served with the choice of two sides, we got fried yuca and vegetables. It was truly delicious. The meat had been marinated and was really tender and it had all the flavors of the vegetables soaked in. The only disappointment were the vegetables which were served as a side. It seemed like they had been previously frozen and were clearly not prepared at the restaurant. We would recommend having the yucca or french fries as sides and avoid the vegetables. All in all, it was definitely a nice experience and a great way to step into the local Cuban atmosphere. We skipped dessert and instead reserved our appetite for a sugar cane juice at Los Pinarenos Fruteria. This local joint is known for its authentic fresh juices made on the spot. We watched the manager preparing the juice by inserting the canes into an old metallic chipper machine. The juice was tasty. Not too sweet and a refreshing end to a delicious meal. Although Miami is the capital for great Cuban-American food, West Palm Beach also has several local Cuban restaurants gems. As we were based not far from West Palm Beach, we explored the local Cuban food scene. 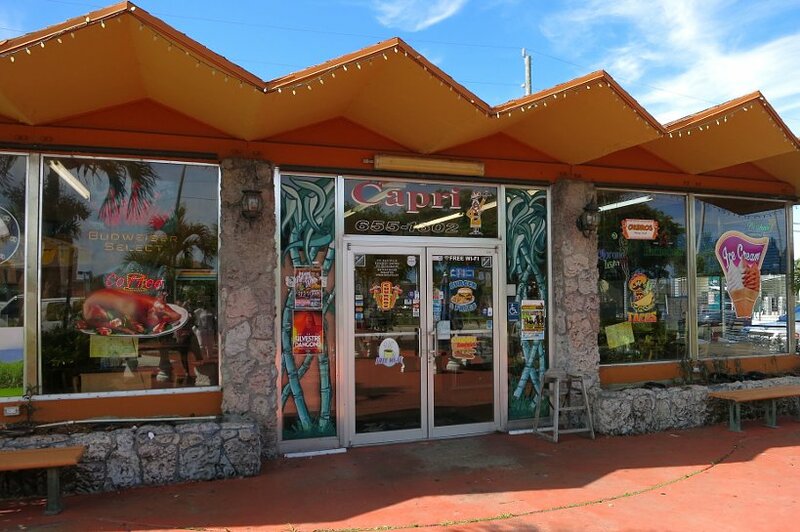 Capri is a casual joint where local Cubans stop to get their quick fix of Cuban food. It is a great place to come taste Cuban food for lunch or for a snack. 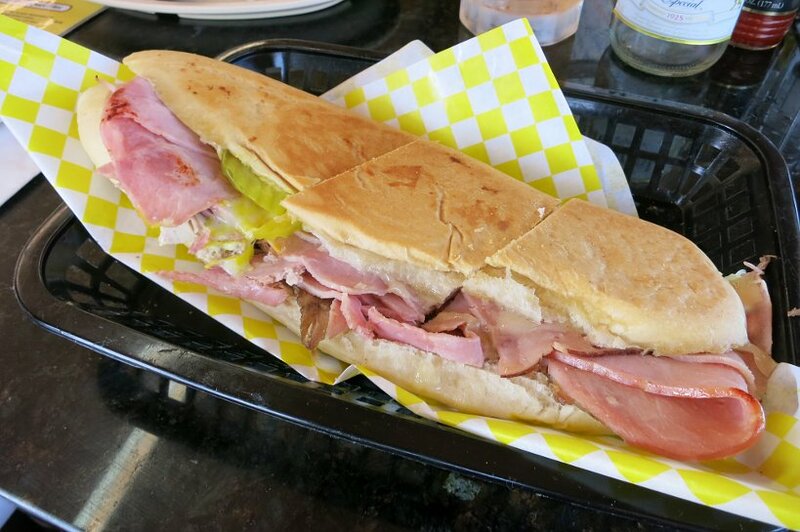 We tried the famous Cubano Sandwich, one of the most typical Cuban sandwiches. Served with rice and black beans, it really makes for a serious meal! The Cubano sandwich is made of two slices of traditional Cuban bread, layered with roasted pork loin, ham, melted swiss cheese, home made pickles and yellow mustard. 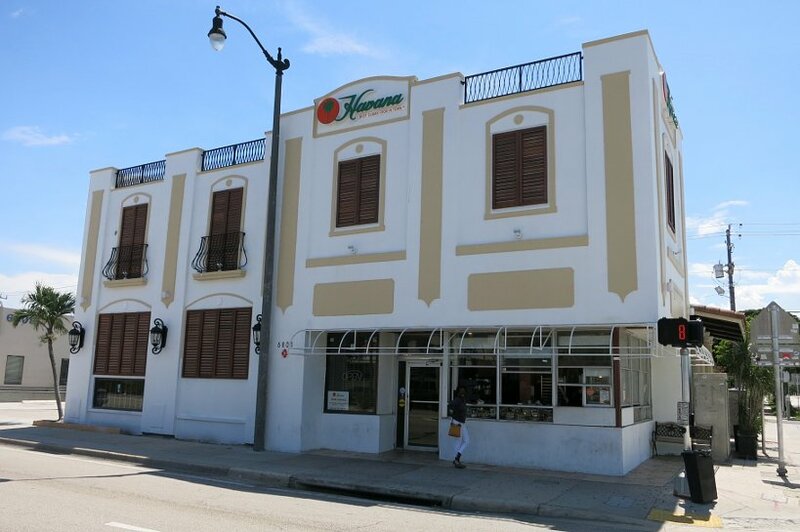 At the corner of Forest Hill Boulevard and South Dixie Highway is where you will find Havana Restaurant which goes with the tagline “Best Cuban food in town”. This two story building has a restaurant section and a very popular to-go or walk up counter. The food here is legendary and known for serving traditional Cuban homestyle cooking. Don’t be surprised if you run into celebrities like Gloria Estefan, Cameron Diaz, Bob Dylan and more. 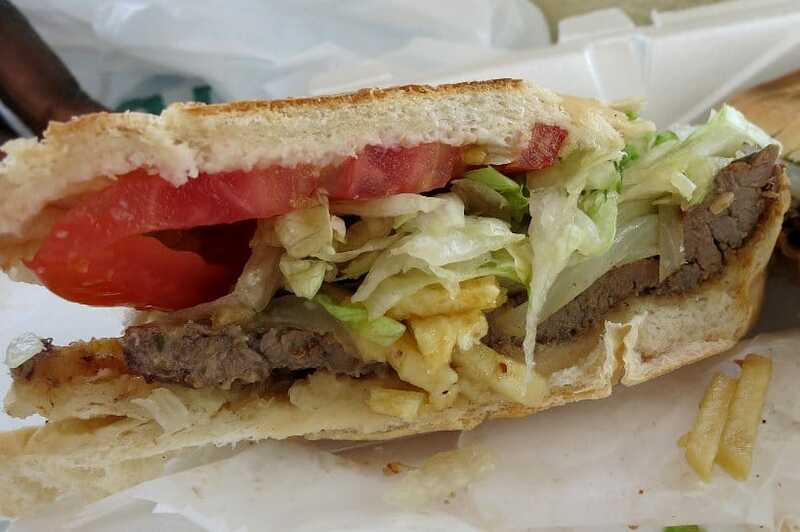 On a sunny afternoon, we stopped by Havana to sample another famous Cuban Sandwich Pan Con Bistec or steak sandwich. Attracted by the warm temperatures, we decided to order from the walk up counter and enjoy the sandwich outdoors. In hot-pressed homemade Cuban bread, a thin slice of perfectly seasoned round steak, sautéed onions, lettuce, tomato and skinny potato sticks complete this sandwich. Delicious! 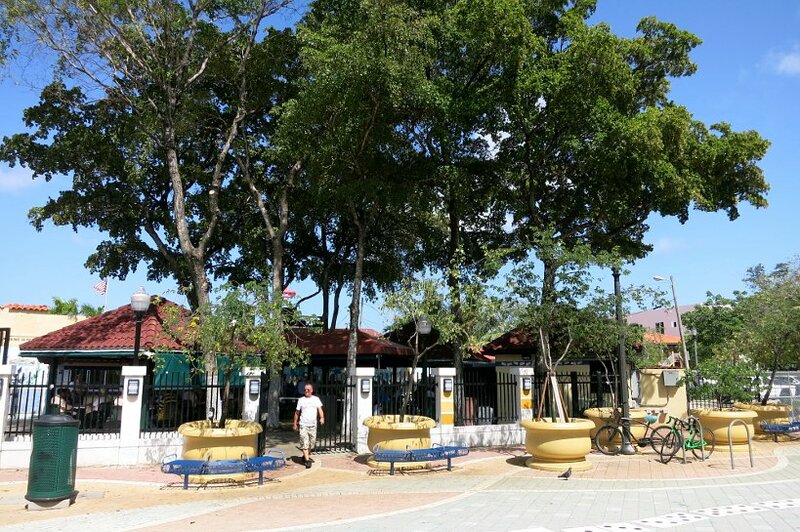 This is a great spot to experience local culture and traditional Cuban food. Up the street from Havana Restaurant, is the well-known Don Ramon Restaurant. This family run restaurant has been opened since 1990 and is another landmark for Cuban heritage and culture. 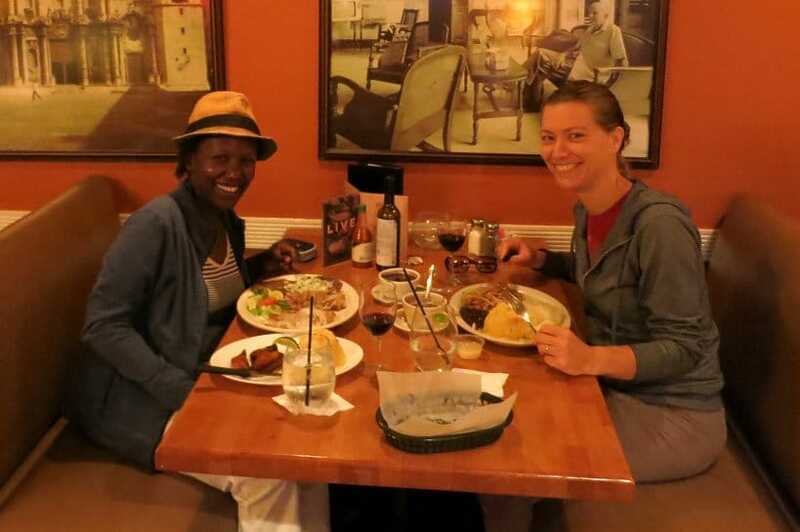 The restaurant is cozy and comfortable and has live music every Thursday and Sunday nights. We stopped in one weeknight evening for dinner. The dinner menu is quite extensive and after going over it and not knowing what to choose, we asked the waiter to make a recommendation for the best authentic and traditional Cuban food. The specialty that evening was a trio of three meats: Cuban-style cut choice beef, chicken and Lechon asado (slow roasted pulled pork). This was accompanied with rice and plantains. The meal was pretty basic, but it did provide a delicious introduction to Cuban food. If you are looking for a cozy Cuban restaurant where you can listen to live music, Don Ramon is your spot. One tip to keep in mind when ordering is to always get the “special” of the restaurant. This is a great way to taste the local delicacies. For more authentic restaurant tips, check out our previous article: 4 tips to have authentic restaurant experiences. The Cuban influence in Miami is unmissable. The next time your travels take you to Florida, the Sunshine State, be sure to indulge in traditional Cuban food. In Little Havana, Florida, experience the delights of Calle Ocho with its authentic Cuban food in Miami. And when you are in West Palm Beach check out the Cuban restaurants that keep the traditional Cuban food alive! Have you had Cuban food before? Let us know in the comments below your favorite Cuban dish, drink or dessert. FLorida would definitely be a great place for great Cuban food, I am so hungry now lunch is soon! And I would love a glass of sugar cane juice. I have not eaten a lot of real Cunban food but my bst was in Queens NYC of all places lol. It’s amazing Evelyne where one can find real and authentic foods. New York is such a melting pot and it’s no surprise you found some there. 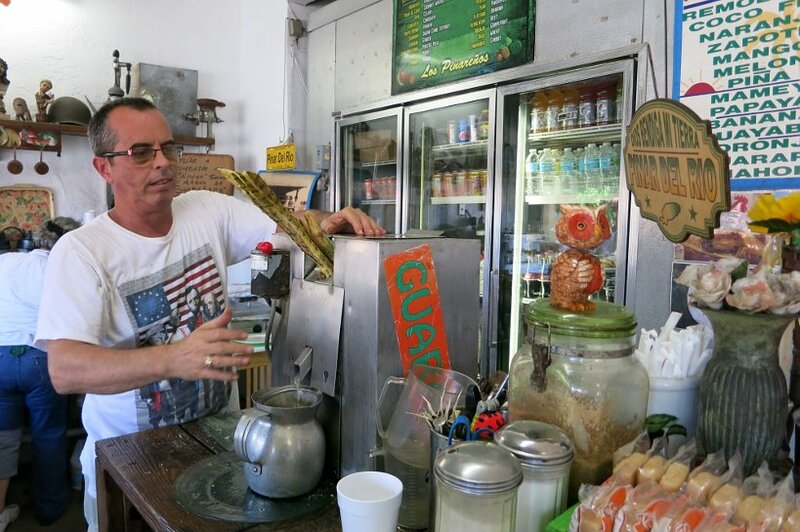 Being in the heart of the Cuban community in Florida is quite interesting. It’s like being in Cuba (though I haven’t been yet)! The experience alone is worth a visit to Miami. The sugar cane was perfect…and delicious. Try it in your neck of the woods. You will not be disappointed 🙂 Thanks for stopping by! Ropa Vieja looks like my favourite dish of the lot. The beef stew looks hearty and home cooked. Love the others too, but beef stew always gets me good. Thanks for sharing, these places looks fantastic. So glad you liked the restaurants Rosemarie. The Ropa Vieja was also one of our favorites as well. See it out the next time you have a craving for Cuban food 🙂 Cheers. You two always know where to find the best food~ I love anything Cuban while in Florida! I think the best way to explore the place and its eating joints is to live there for sometime. Slow & steady. I have never done house sitting but would like to explore this opportunity. Great, you could write a book doing that! Thanks so much Nisha!! You are right, slow and steady travel is the best way to go. One does get to appreciate the area and people deeper 🙂 Do check out house sitting if you are interested. Feel free to reach out for any pointers as you get started. Neat idea for the book….will keep that in mind 🙂 Thanks so much for stopping by. 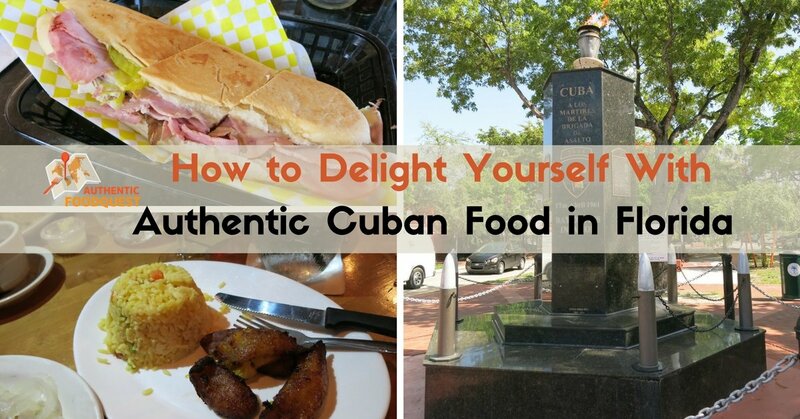 Having lived in Tampa for 2 yrs i had the fortune of eating authentic delicious Cuban food. Cubans are my favorite sandwiches, love their pork dishes and ropa vieja! Nothing beats ending the meal with a nice cuban cigar with cuban coffee! Didn’t know that you lived in Tampa Prateek. That means you really appreciate the Cuban food and culture. Indeed the sandwiches are the best and the ropa vieja is delicious. Love your take on how to end the Cuban meal!! Thanks for your comments. I’ve never had Cuban food, but I’m positive I’d love it! Those Cubano sandwiches look amazing and I could really go for one right now. It looks like you had fun in Florida. The area that you were in is one of my favorites in the states. I love the cuban food, it’s a lot different than other cuisines. I’m glad that you had fun! Thanks so much Krysten. We definitively appreciate your support. So glad to read that you also love Cuban food. It is indeed delicious 🙂 Follow along on our quest for even more authentic foods 🙂 Cheers! I think it’s great to find a slice of authentic culture from one country sitting in the middle of another place. Very cool that you found a little bit of Cuba in the middle of Florida! Great post you guys. It all looks so delicious! Hopfully everyone is OK after the recent storms and these places pulled through. Thanks so much Carrick and glad you like the post. From what we know so far, everyone has survived the recent storms 🙂 Let’s hope the hurricane moves away. Appreciate your concern. Cheers! I love the Roupa Vieja, we have a similar dish in Brazil, but we add a fried egg on top of the beef stew… yummy!!! So glad you love the post, Natalie. That is so interesting that there is a similar dish in Brazil. Love the idea of the friend egg on top of the beef stew. Yum. Really need to get to Brazil soon!!! Cheers. Everything looked delicious! We also have sugarcane juice here and I love it. It’s fascinating to watch too when the sugarcane is loaded into the machine until it presses out the juice. Would love to try that Cubano sandwich! You are right, so interesting watching the making of the sugar cane juice. Delicious as well. The Cuban sandwich is great. Hope you can try some Cuban food soon. Thanks for your comments. Thanks for the great round up! We loved spending time in Little Havana while we were in Miami. I can’t remember where we ate but I do remember the food was remarkable. Was wonderful to have had such an authentic experience, as close to Cuba as you’re going to get in the States! Great feedback Meg, thank you so much. It is wonderful to enjoy such authentic Cuban experiences in the U.S. Little Havana is full of character. We also enjoyed our time in Florida tremendously. Cheers! The Ropa Vieja and Cuban sandwich are right up my street and sound so yummy! I don’t know a lot about Miami but am surprised there is such a Cuban culture there- I cannot wait to check out all the food when I go! Awesome, please let us know when you go Miami. There are lots of great places and amazing food to check out. You would love the Ropa Vieja and Cuban sandwiches. So good!! I was literally just saying yesterday how much I miss the Cuban food in Miami! We used to live about an hour north of Miami and always loved going down to Little Havana–El Exquisito was one of our favorites. 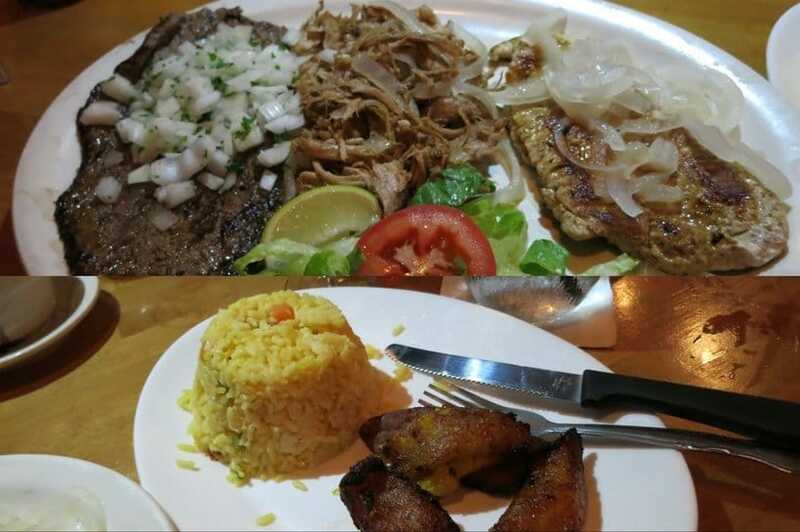 We went up to West Palm Beach regularly, but never made it to Havana Restaurant or Don Ramon–we will have to check them out when we are back in the area sometime! This just made me hungry, lol! Lots of great suggestions-thanks for sharing! How wonderful to hear that you are also a fan of El Exquisito. Great ambiance and authentic dishes! The next time you are you in West Palm Beach, you will be surprised by the amazing Cuban food. Thanks Jenna for your feedback. It’s interesting because a friend of mine is traveling to Cuba at the end of this weekend and as we met a couple of days ago I asked her ‘what is typical Cuban food’ and she said ‘beans and rice’ so I’ll send her this to show it’s not just that! Yes indeed, please show her this post that explores the variety found in Cuban dishes. However, to your friend’s experience. Most of the dishes did come with rice and beans as well. So, rice and beans do dominate but there is more than to Cuban food than that. Cheers! Florida looks like the place to try some amazing Cuban food. I have never been but it’s definitely on my list!